Description: This vibrating coil resonates on a surface playing with different rhythms and percussions. 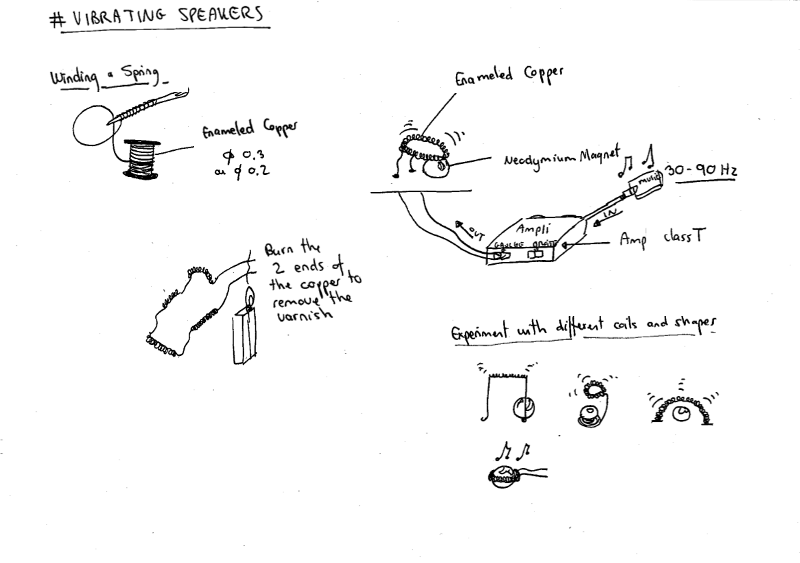 Using the principal of the electromagnetic coil observed in speakers and solenoids, sound frequencies between 30-90 Hz will allow to control and activate this hand crafted artefact. These experimentations are part of a larger research shown throughout a electro-mechanical installation. amplifying and materializing sound and electromagnetic principals in a poetical way. 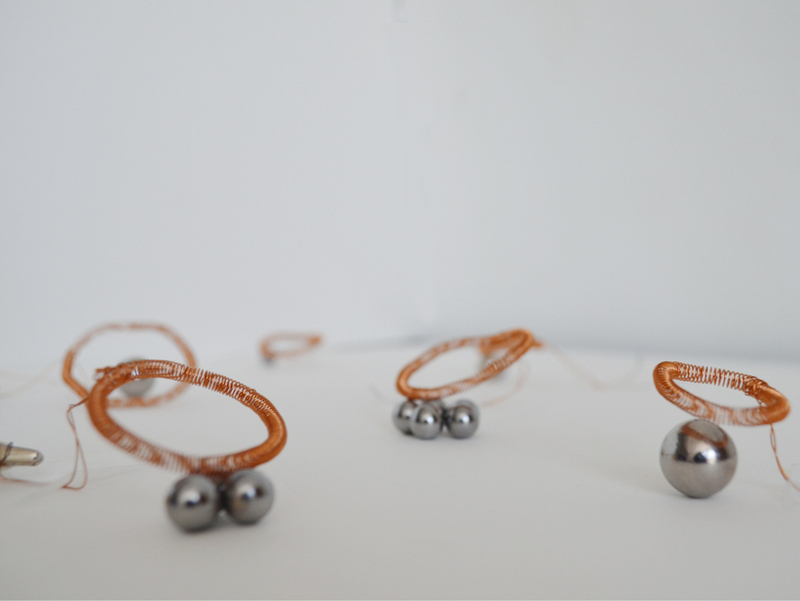 It is an ongoing research conducted on crafting experimental textile coils, inspired among others, by the textile speakers experiments of Hannah Peter Wilson. Since this is a very low impedance speaker (less than 1 ohm), a class T amplifier will work best. Amplifier with a TA2022 chip – Class T or TPA3116D2 chip. Crafting a coil that creates a strong magnetic field. 1/ You can find a cylindrical object of approximately 3mm diameter. 2/ Wind your copper on it to create a spring making approximately a 100 turns. 3/ Take it of and attach it to form a loop. 4/ Burn the 2 ends of your copper wire to remove the varnish. 5/ Connect the 2 ends in the right or left output of you amp. 6/ Place your coil on a hollow surface such as a metal bowl for instance. 8/ Add your neodymium magnet in the center of your coil, you should feel the vibrations getting stronger when you place it at the strongest magnetic field position. NB: Don’t put the volume at maximum position, start at 12 o’clock and then go gradually higher or it might overheat your coil. If you hear or feel a clicking sound it means your volume is too high so lower it down until it stops.